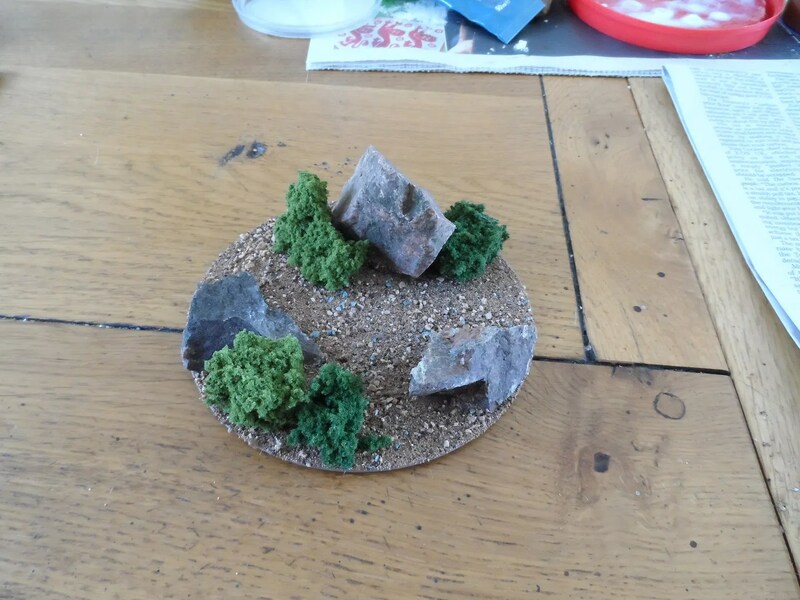 One of the scenery pieces I have been planning for some time is rocks. 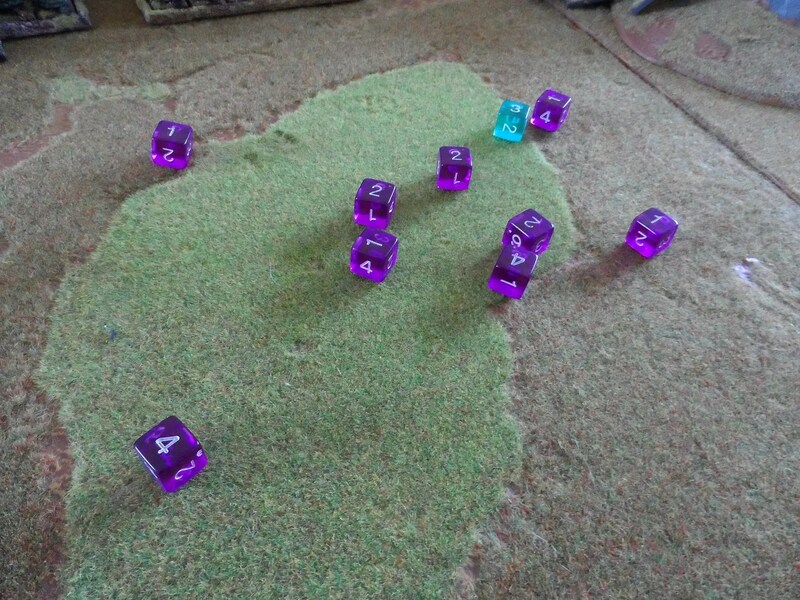 I need some additional not trees, not bushes cover for my games, so rocks it was. Hmm, then I thought I could do them for both AVBCW, BoB/RCW and Laserburn, so that required a lot of rocks, more than my gravel drive could provide. 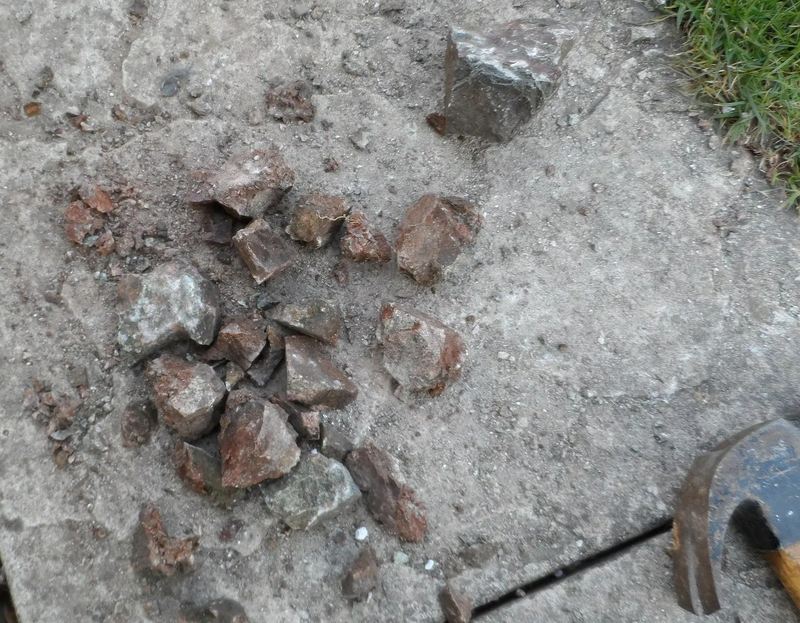 So I headed off into the hills and got both some readily sized ones and some larger rocks that could be beaten into shape. 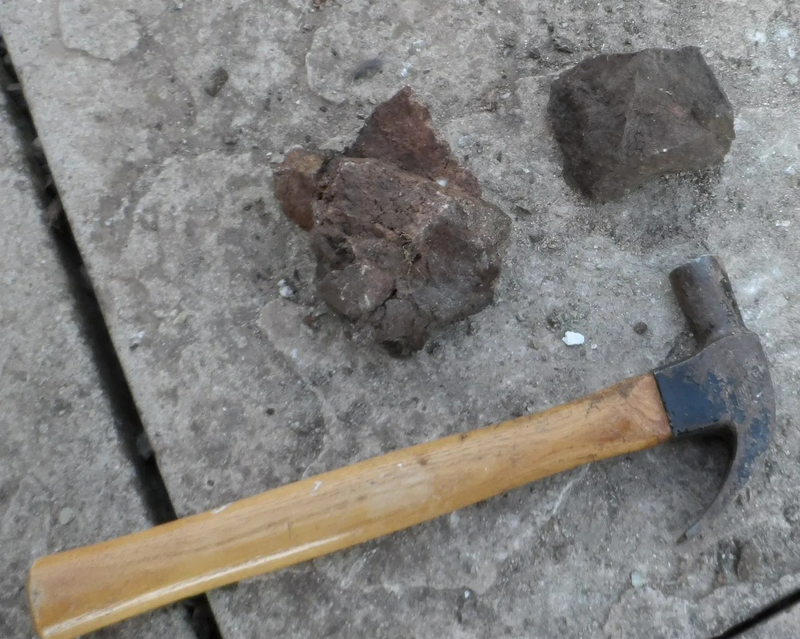 Three large chunks of rock, and the claw hammer. And you have to smack it into useful sized pieces of about 2-3 inches. The Malvern Hills are formed of some of the most ancient rocks in England, mostly igneous and metamorphic rocks from the late pre-Cambrian, known as the Uriconian, which are around 680 million years old. This has multiple cleavage planes (steady), so you get random sizes and shapes of rock. 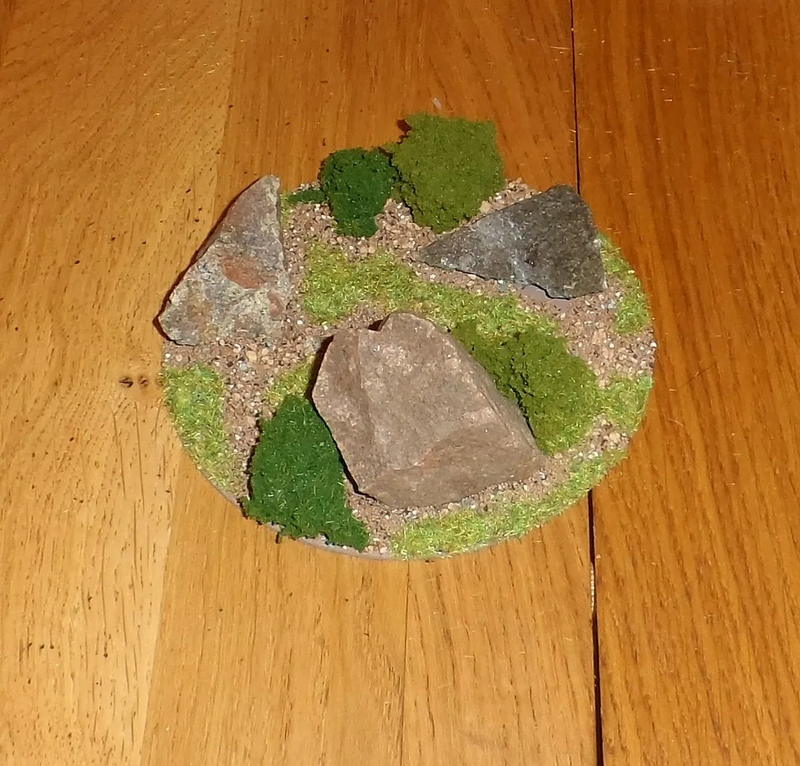 As some of these are going to be used for my AVBCW games, it was most appropriate to use a locally sourced rock for the scenery. 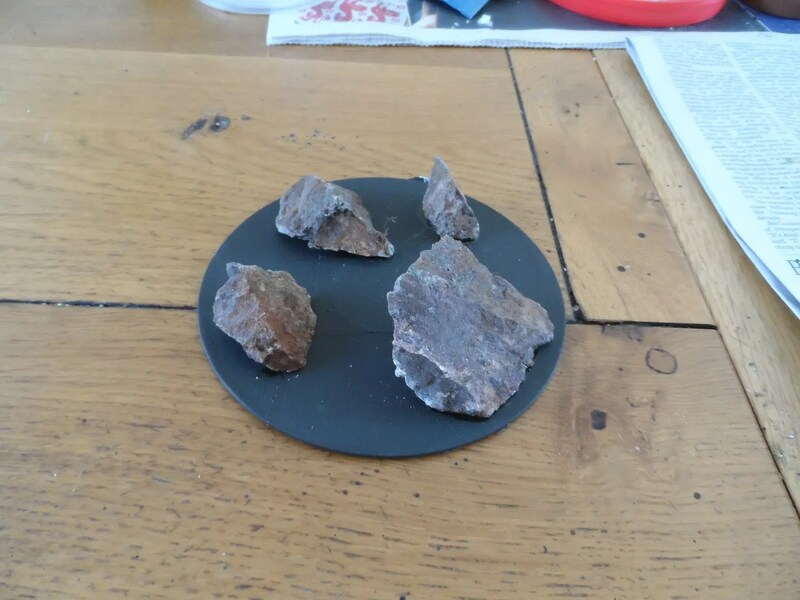 So after a smashing time I broke up the 3 large rocks I had acquired along with smaller ones, and made enough for some CD bases as usual. The ground flock made them blend in too well, so I made sure the bushes and static grass surrounded them so the rocks would again stand out. You get about 60 inches in one pack, complete with two gates. 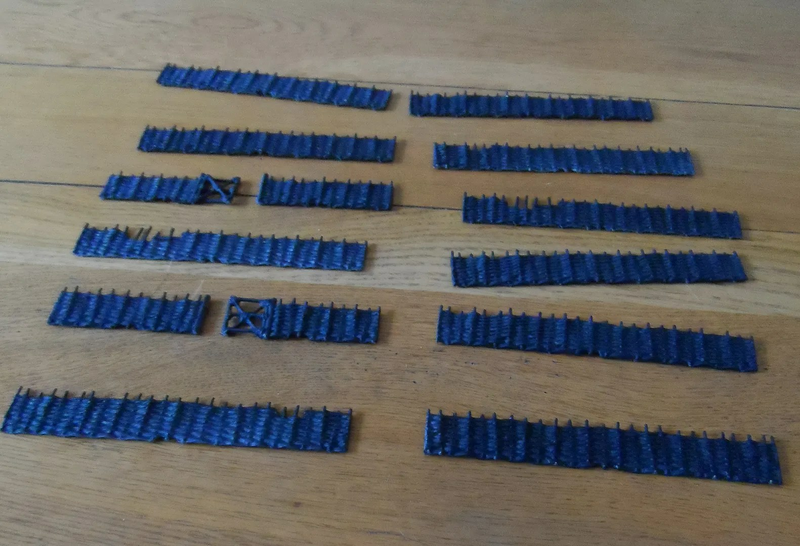 They come with a single plastic foot per section, so as they are also light plastic, will fall over as soon as you look at them/knock the table, therefore I decided to base them on medium thickness card. 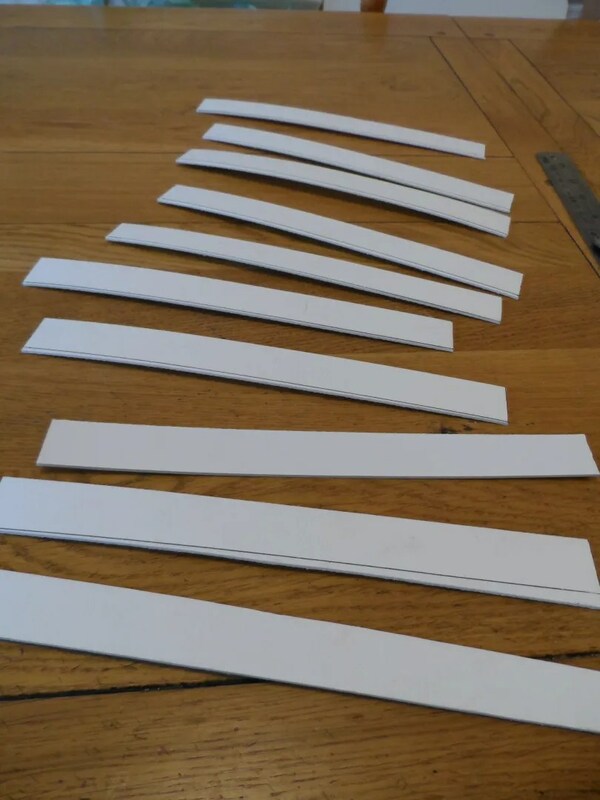 Of course cutting card into strips only an inch wide oten makes it curl up a lot. So I used my parents’ guillotine instead. the ends were tapered so you can them form corners. You don’t often get to purposely build a new army, well I don’t. 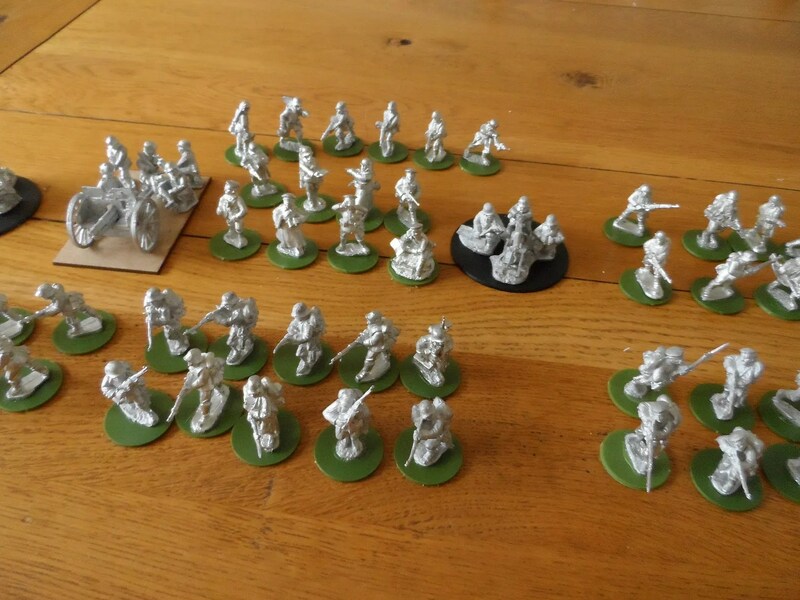 On my list of stuff to sell was a rather randomly bought pile of WW1 Germans from Brigade and Great War Miniatures. Nothing wrong with them, I just bought them on whim and found I had no need or them really. Well up untiul I decided to do the Big Game for BoB this June. So I sorted through them and found I needed to round it out (yes really). 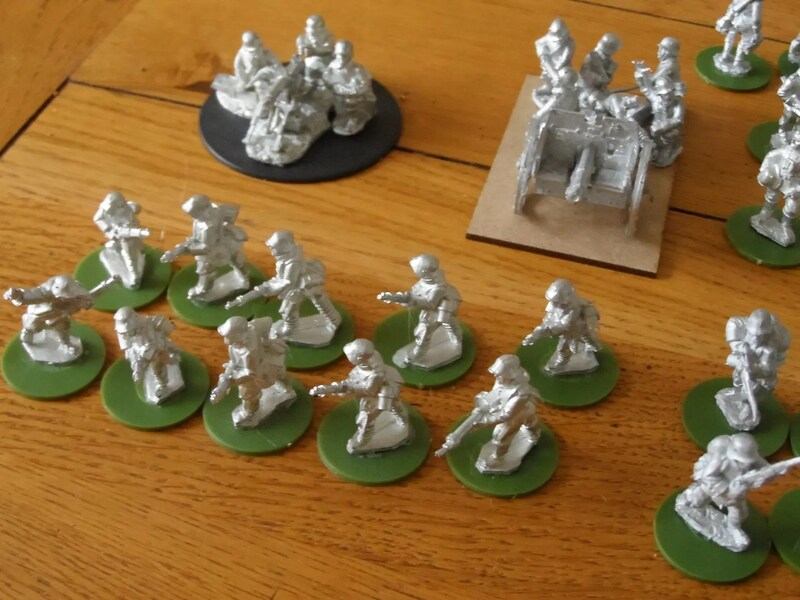 So I could have three core infantry units plus a command unit and HMG. I decided to add to that another HMG and an artillery piece. 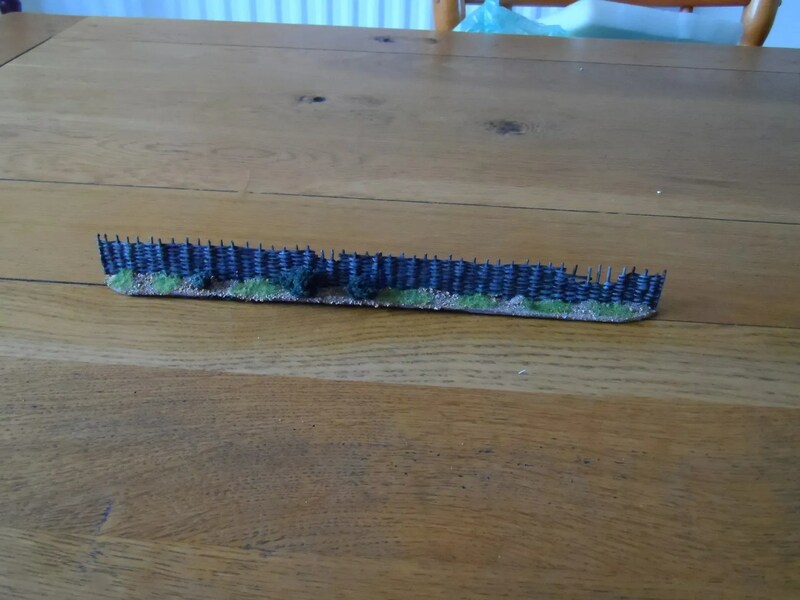 The Germans didn’t use any tanks on the Eastern front at all, and had only a small amount of A/Cs, so if I was to field them they would have to be balanced out with more HMGs, and maybe a fourth infantry unit – the infantry not being armed heavily with LMGs or SMGs, and not trained as stormtroopers either ! 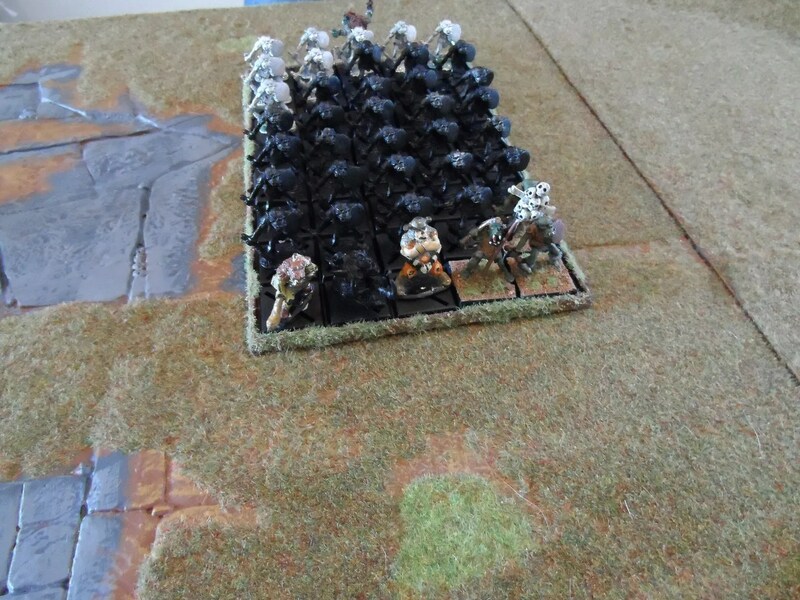 So that’s about 4-5 units of 10 troops and a couple of HMGs, plus the artillery. Now to dispose of the 40+ troops I cdon’t need. 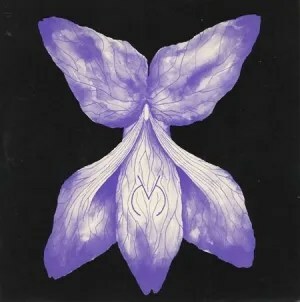 As per my previous Snippet, the tracks on the album (Made Glorious) will have been remixed, so the EPs (good as they are) will have different versions to the album tracks. There are slightly different mixes of most tracks, We Are All Gods III is very different. I really wanted to put them on, they are part of the original intent. Teasing? There is one absolutely stonking Remix by Skin Job which will most certainly become a dance floor filler. Guess which track? …because we are expecting an early listen to the entire album this month. New page for some of the ruins Gav A and I fought over yesterday. I’ll be cycling through all the scenery items I have over the coming months so everything is covered. …have just completed the reworked version of London’s Drowning for the album, more guitars and even some real wave sounds for that watery feel! So don’t assume if you own the EPs, the tracks on the album will be the same. 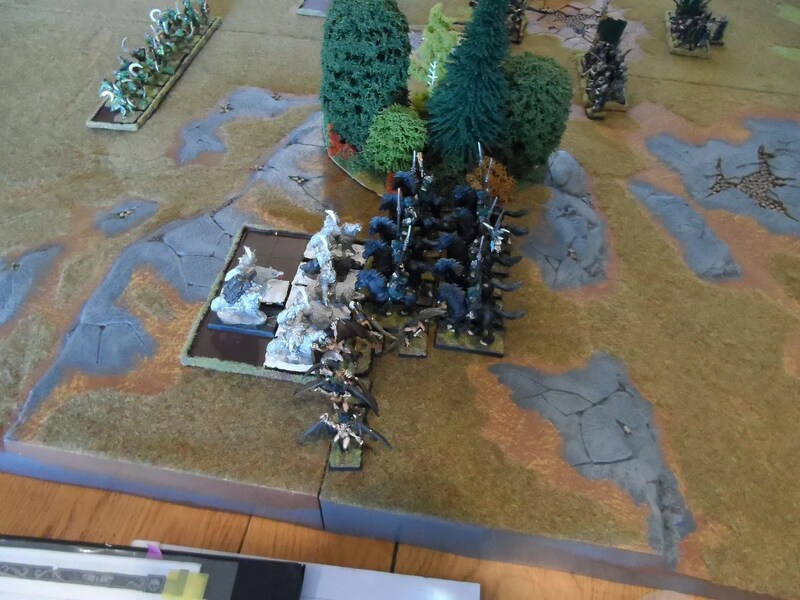 Byakhee Gav A and I had a short notice WHFB game today – I used last w/e’s army list due to the short notice and also to test out whether I’d won by sheer blind luck or whether there was some merit in the army list. 3k of PV per side. 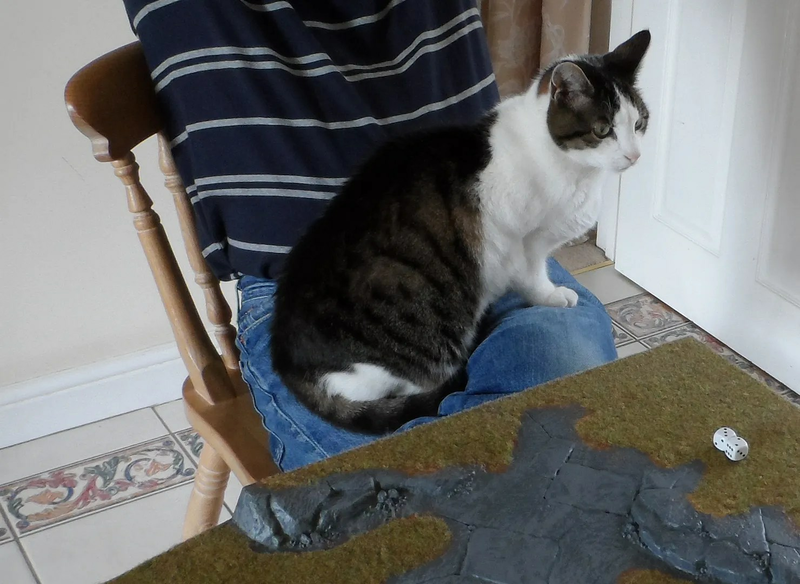 I deployed my secret weapon – Cat ! Clawed was very nervous and edgy around humans when I rescued him (a stray) so I think it is good he is now confident enough to sit on most of my large, insanitary and noisy byakhees without fear. 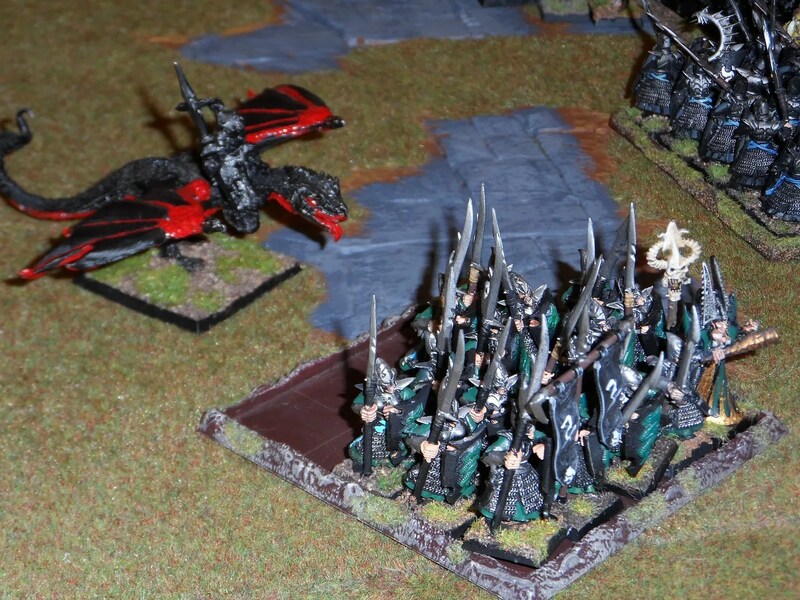 The Harpies and the Dark Riders charged into the Orc Wolf Riders, and a terrible grinding combat ensued. Meanwhile, twinkletoes the giant and COK danced around each other to no effect. 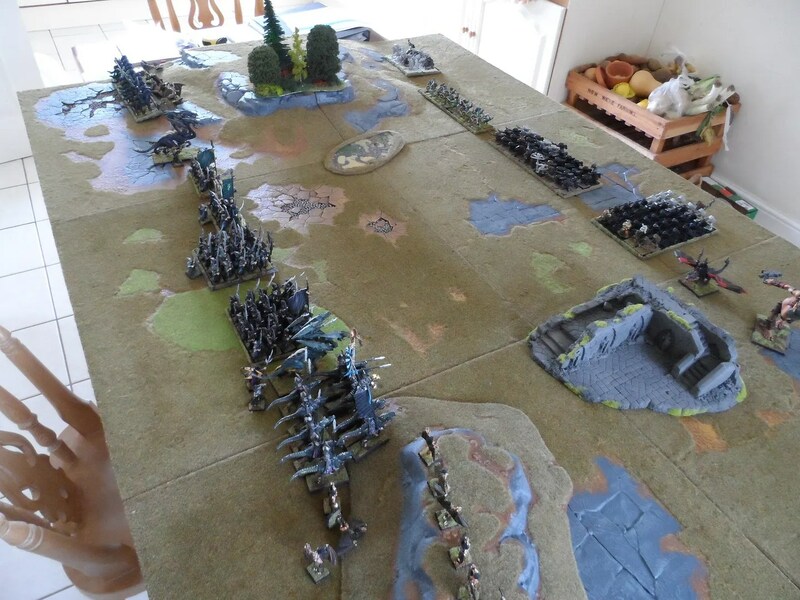 Gav managed to roll some lousy Animosity tests that left harboth’s 40 Boyz standing around at the back allowing the second War Hydra and the Silver Talons to march up close. No, they were still locked in combat, after three rounds ! Orc Wolf Riders, DE Dark Riders and Harpies ground each other down. The War Hydra defeated the Black orcs and over-ran them. 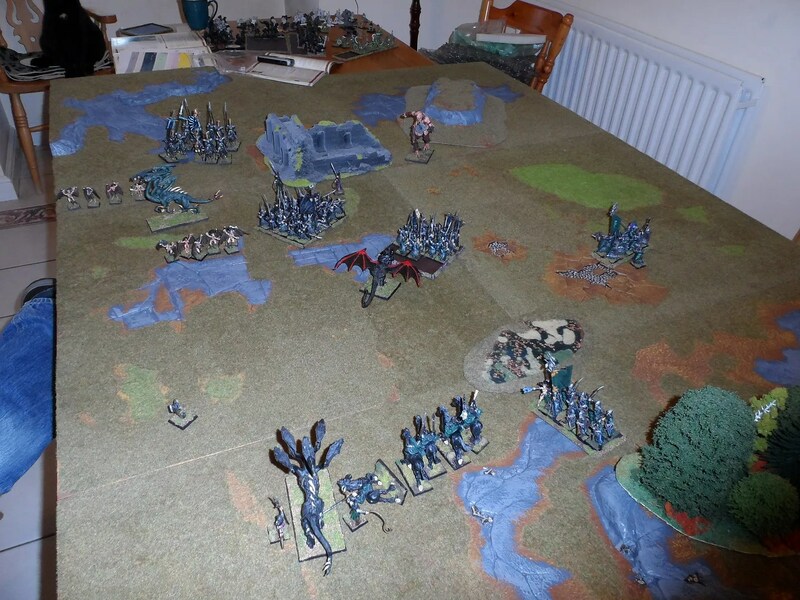 The Spearmen charged the Orc General on Wyvern saw him off, only to ind he returned for more and beat them ! 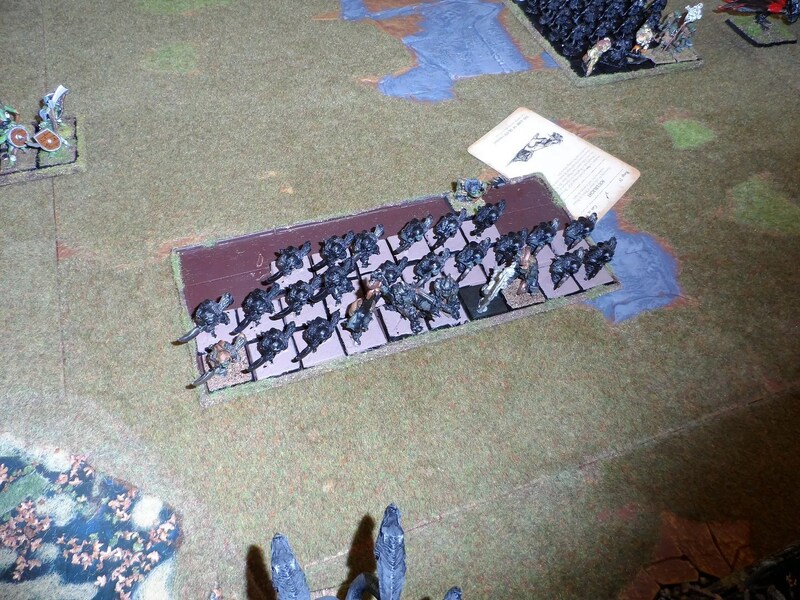 Meanwhile the Dark Riders finally broke the Wolf Riders and rode them down freeing up my flank. 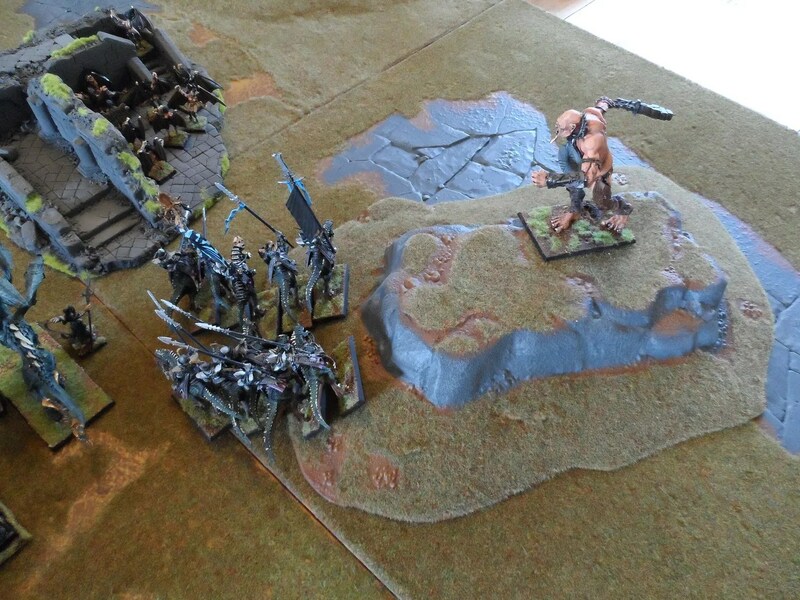 However, Harboth’s having charged the second War Hydra and received a sever mauling got the Silver Talons in the face as well, and were soundly defeated, the Harpies killed the Orc Shaman, leaving the Giant out of the action and just an Orc General surrounded on three sides by a pretty much unharmed Dark Elf army. I counted about: 4 Harpies dead; 5 Dark Riders; 3 Silver Talons (Spearmen); 12 Spearmen; 2 RXBs; and one War Hydra at half wounds. In return I’d killed: 40 Black Orcs; 40 Big ‘Uns; 20 Savage Orcs; 10 Wolf Riders; a Lvl 4 Shaman; and an Orc General missing half his wounds. So the same army did another decisive victory. Luck ? Not with those dice ! 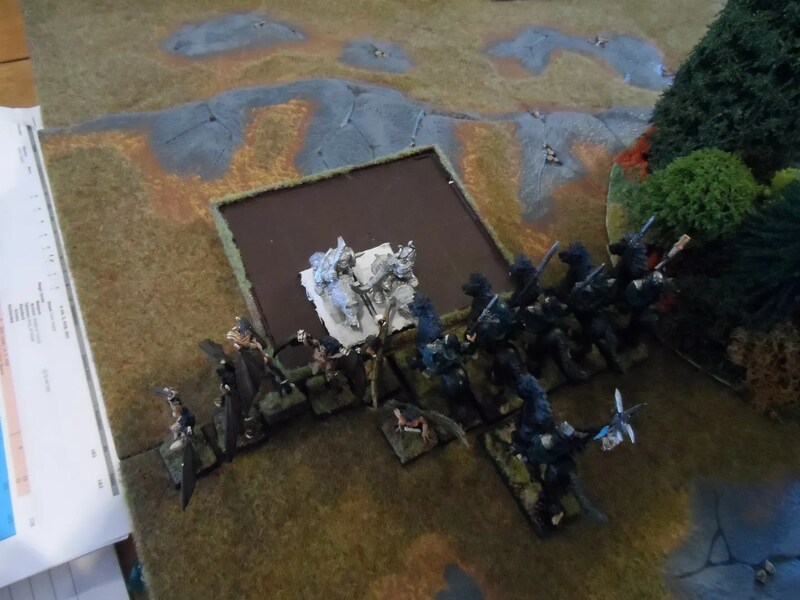 True Gav’s Animosity rolls had hampered him, but his plans and deployment were sound. I think I might have a half decent army list here. Louis, fired off a load more pictures available here. 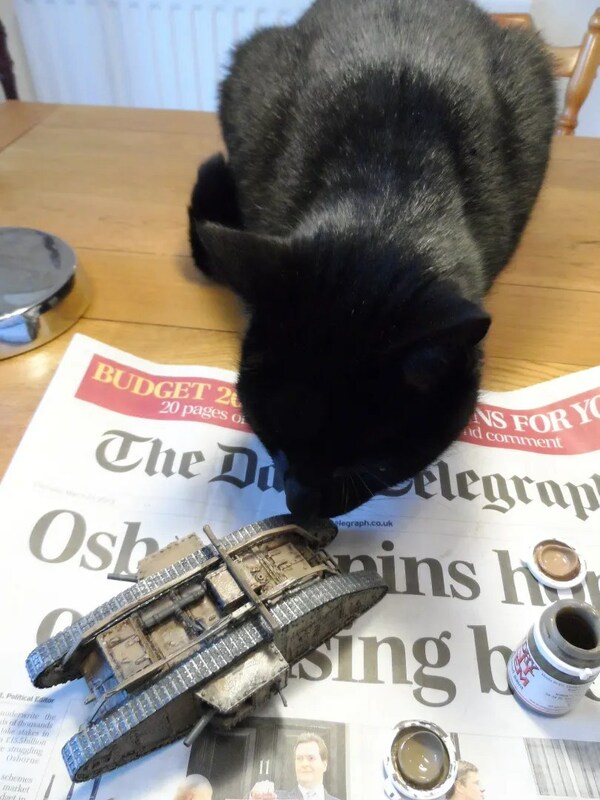 My mate Mort also turned up to collect his Cossacks, and drool at the train, he was impressed by the scene of carnage ! Way back when…when I was 16…Goblin Green was the base colour of choice, yes really. 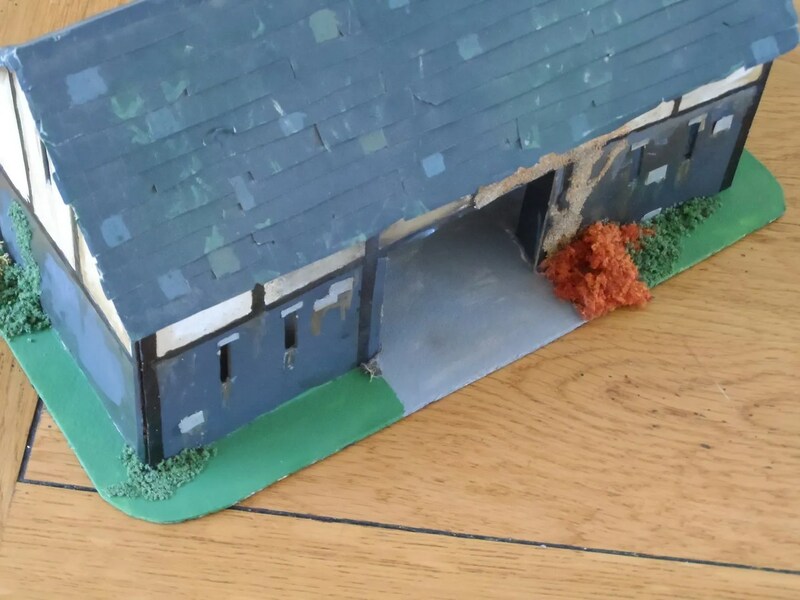 Looking at the photos or some o the AVBCW games recently the Goblin Green base coat for my barn jarred somewhat. 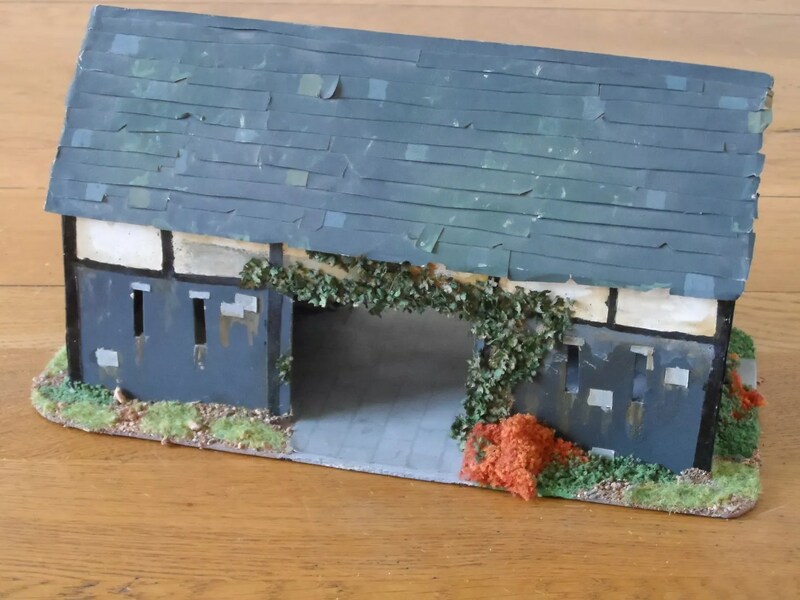 Ok it was a card and paper build I did when I was 16, and jazzed up a bit when I was 18 or so. But still, it was time to renovate it and bring it up to date. 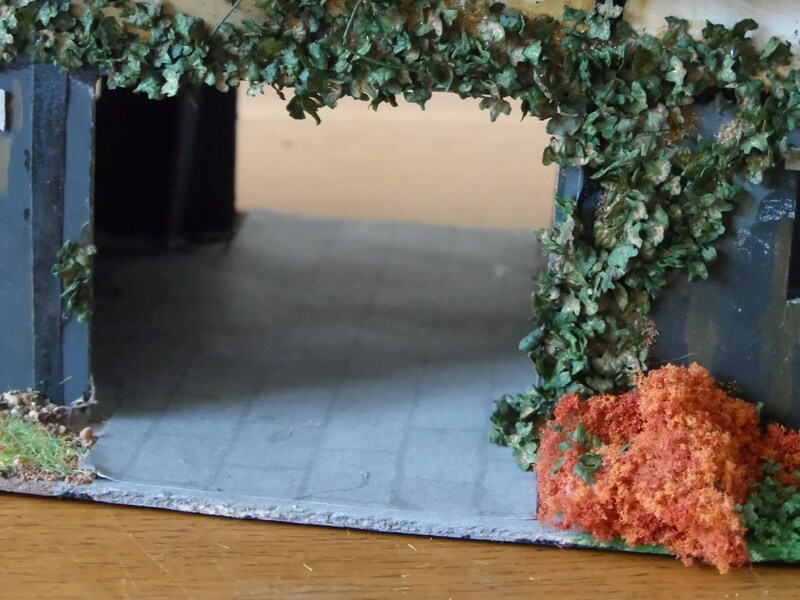 So some of the base biscuit paint for the base paint, and then the usual mix of dark scatter material, followed by medium green static grass. 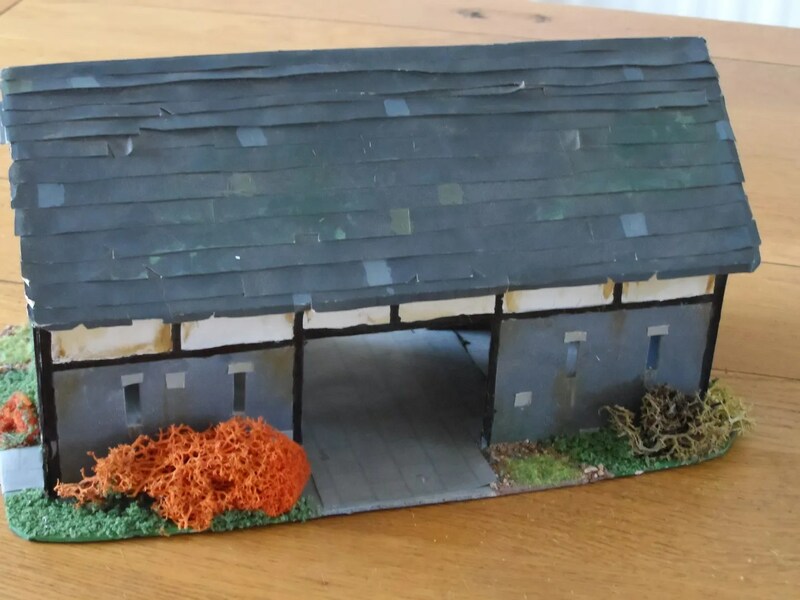 Then I followed it up by adding some of the block paving paper that I bought – ISTR cursing not painting the interior of the building even back when I was 16 and now cursed trying to get the paper to fit into the interior of the barn. It worked in the end. 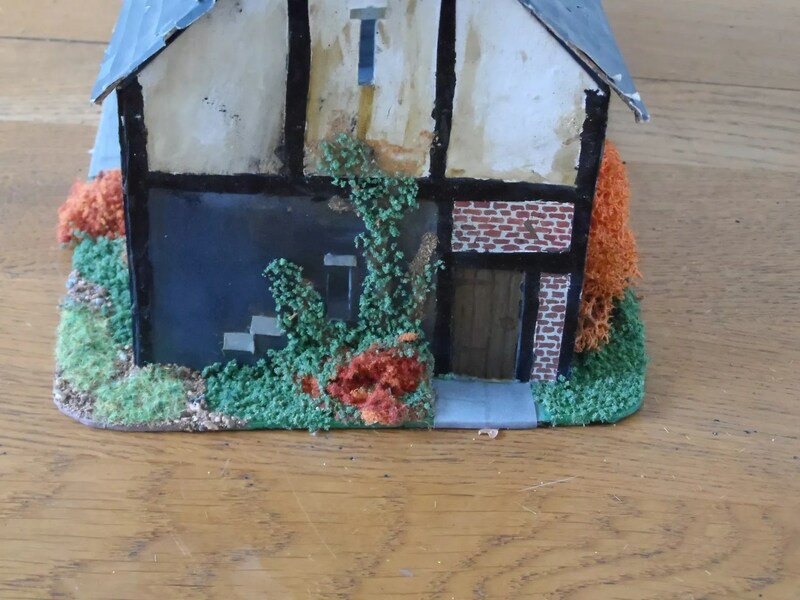 Along with a tiny bit for the side door. And added some leaves to represent ivy as well to replace the VERY faded flock I’d used all those years ago. 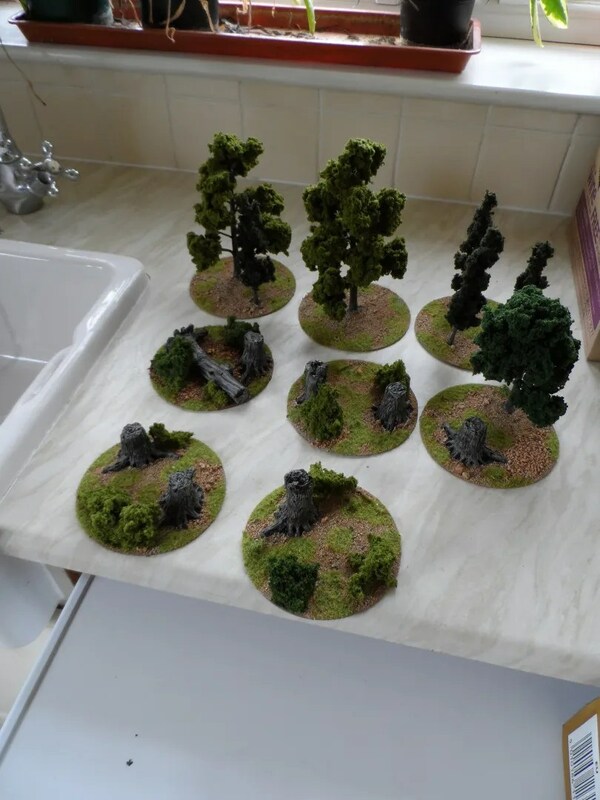 Whilst waiting or that lot to dry I did some more Cd scatter bases for BoB and AVBCW.